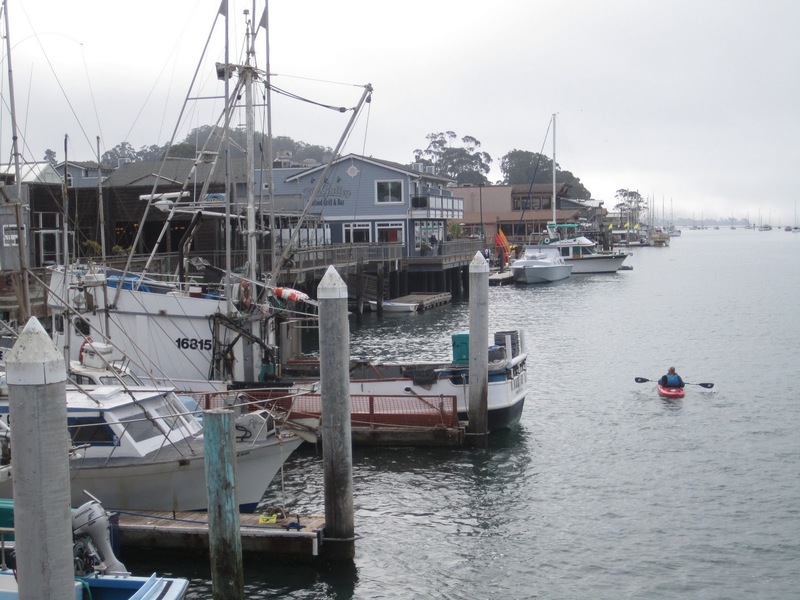 Morro Bay was probably the most chilled out stop on our California road trip. We arrived at about dinner time, and strolled down to the waterfront to find dinner with a view. We found a likely looking restaurant on the embrcadero, and had an adequate dinner coupled with a really quite good margarita (which I needed after driving the entire coast road south from Monterey- this kept me from getting carsick, but left me a little tense). After dinner, we strolled along the deserted embarcadero a bit and then spent the rest of the evening in our beautiful suite. We'd booked into the Beach Bungalow Inn and Suites, and were delighted to find a comfortable, nicely decorated suite. It only had one bed in the bedroom, though, so this was where Hubby came up with the idea of getting Pumpkin to sleep on the sofa while I got Petunia down, transferring her to the bed so he and I could hang out in the living room for awhile, and then transferring her back to the sofa for the rest of the night. It worked really well. The next day, we had a truly wonderful breakfast (for us)/morning snack (for the girls) at Frankie and Lola's Front Street Cafe. Really yummy food, and just out the front door, a view of Morro Rock. After we ate, we strolled along the embarcadero, eventually stopping park at the far end of it. 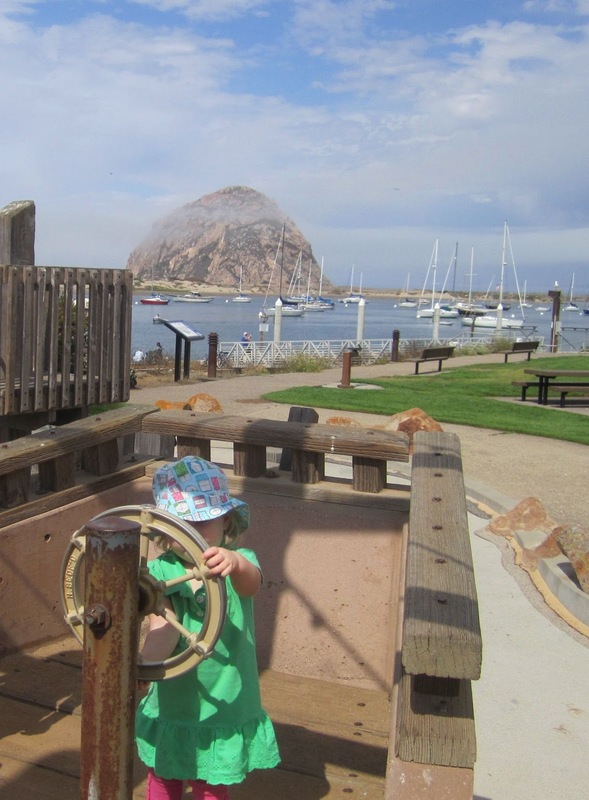 It was a much simpler playground than the one we'd played at the day before in Monterey, but the kids still had fun. 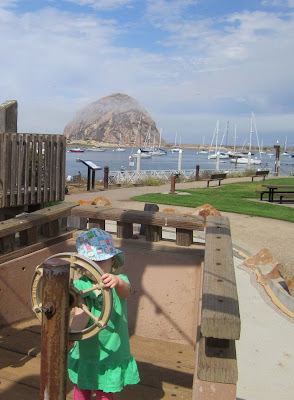 Petunia particularly liked the steering wheel on the wooden boat- she'd been enjoying steering wheels for the entire trip. The kids played while the adults enjoyed the view of the harbor, which is peaceful and full of birds and the occasional seal. We eventually strolled back along the embarcadero and found a spot for lunch. We picked the spot because there was a flute/saxophone player playing nearby, and Petunia was intrigued. Unfortunately, he wasn't all that great. But Petunia liked the music, and at least we had a view of the harbor. I'd love to go back some day and explore it in a kayak. We heard a lot of seals, but only occasionally caught sight of them. Pumpkin really enjoyed looking, though. We strolled around just a bit after our snack, and Petunia found a fire hydrant to hug. Then we drove on to the final stop on our trip: Santa Barbara. 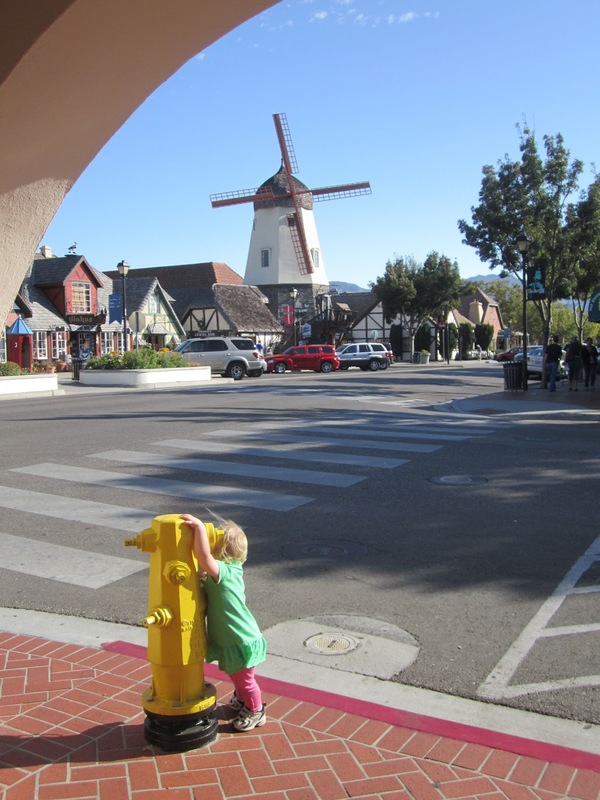 I love this whole hugging-a-fire-hydrant thing that Petunia has going on!